Author of The Hamburger: A History, Josh Ozersky, reveals his top ten burgers of 2014. Only a madman or a glutton with infinite resources could hope to eat every hamburger in America. Think of how big the country is! And yet, it would be equally ludicrous to suppose that the 10 burgers I listed on CNN last year are still the country’s best. Every year new hamburger debutantes have their coming out parties, and each year obscure starlets emerge from the hinterlands to enchant even the most effete of critics. Here then is this year’s edition. Not all are new; and not all are necessarily mind-blowing. A few, like Hildebrandt’s and Dyer’s, owe as much to their picturesque surroundings and rich history as they do to the salt and blood of their beef. But all 10 of these burgers deserve our attention, our respect, and most of all, our willingness to eat several of them, one after the other. Like New Haven’s Yankee Doodle or Meridien, Connecticut’s Ted’s, this obscure Providence burger bar transcends its humble New England roots, producing a blue-ribbon slider so classic that it might have passed across a lunch counter in 1927. Salty, brown and with nary a daikon to be found, this old-school classic was my favorite discovery of 2013. When Montmartre chef Michael Toscano told me that he wanted me to try a patty melt filled with béarnaise sauce and creamed spinach, my first impulse was to wince, and my second to run. I did wince; but I didn’t run. And I’m glad I didn’t. Generally, I find patty melts, essentially grilled cheese sandwiches with a burger patty in the middle, to be disturbing freaks, two fine sandwiches yoked into a unnatural union. Add in creamy, piquant béarnaise and creamed spinach, and the thing sounded like a recipe for horror. And instead it was great! All of the elements work together beautifully, and thing is lush and creamy and meaty and crusty all at the same time. I’ve had Alden & Harlow’s Secret Burger only once, and that one was smuggled out for me without the chef knowing. Such is the reputation of this hamburger that I was afraid to get it in person. If, as I suspected, it was all hype I wouldn’t know it from the soigné product they put in front of me. But lo! The Secret Burger more than lived up to its reputation. None of the orthodox burger elements are omitted: the bun is squishy, the sauce Thousand Island-y, the lettuce and tomato dispensable, as always. I hated the dehydrated piece of Cabot cheddar, and almost left the thing off this list because of it. But there is no burger on this list that has more magnificent meat, a three-way Creekstone blend to which has been added some secret smoked element. I should say here that I like everything at Trifecta. But of all the things this Portland newcomer has going for it, a double pimento burger is—to me—the best. Pimento cheese has a Southern connotation, but it’s sweet and artificial and phosphorescent, and so looks good on crusty brown patties oozing juice and fluid. The fries are good, too. Speaking of White Castle: In the wake of the chain’s success, the country was inundated with knock-offs and clones—Blue Castles, White Towers, White Mannas, White Diamonds, Royal Castles and many more. (Others, like Krystal and Kewpie, took on other names.) White Hut belongs to this ancient tribe, and with three locations in central Massachusetts more than lives up to their low standards of flat, greasy, onion-y, and soft-as-gnocchi hamburgers. There is likely some old-time burger shack somewhere near your house that is like White Hut, only not as good. Sticking with the old school, Dyer’s deserves some credit here. The Memphis institution has one of the boldest and more revolting boasts in the business: It has been deep-frying hamburgers in the same dirty oil for more than 50 years. The bluesy, Beale Street setting adds much to the flavor, but it actually is a singular taste experience, because tallow, too, can carry a whiff of terroir. 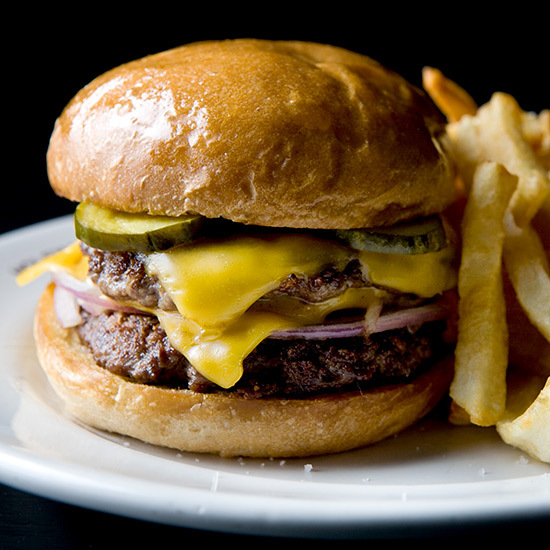 My previous list praised Company Burger in Atlanta, and rightly so, but that burger was generated by Holeman & Finch, a classy cocktail bar whose food program is under the owlish gaze of the great chef Linton Hopkins of Restaurant Eugene. The burger, another double, departs from the old-school model in many ways—an in-house bun, artisanal ingredients—but it’s true to the spirit of the old burgers. Also it’s very good. Especially with a martini. There is a wistful, elegiac note to this list; some of the places on it might not be here next year. They therefore deserve to be honored now. Hildebrandt’s is primarily a candy store and ice cream parlor, and it looks like someplace where Archie might have taken Veronica—to name two more defunct figures. A small grill is usually occupied with flat burgers made from meat delivered daily by a local butcher. If there is a more quintessential hometown hamburger, I am sure I can’t imagine what it could be. The Smoked Meat Burger at first perplexed me. I love pastrami, and I love hamburgers. But putting pastrami on a hamburger strikes me as a cheat. But in packing both beef and finely cut pastrami into the same burger and aggressively cooking it on hot iron, some happy synthesis of the two is created, and when dressed with thick pickles, it makes me happy to be living in strange times.